Turkish Interior Minister said the total damage caused by the Taksim Gezi Park protests is over 70 million Turkish liras. Turkish Interior Minister Muammer Guler said Tuesday four civil and police inspectors would examine "every single detail" related to Taksim Gezi Park incidents. "280 workplaces, 6 public buildings, 103 police vehicles, 207 private cars, a police station and 11 service buildings of the (ruling) Justice and Development Party were damaged due to the protests" Guler told lawmakers. Guler said the damage caused by Taksim Gezi Park protests was over 70 million Turkish liras. 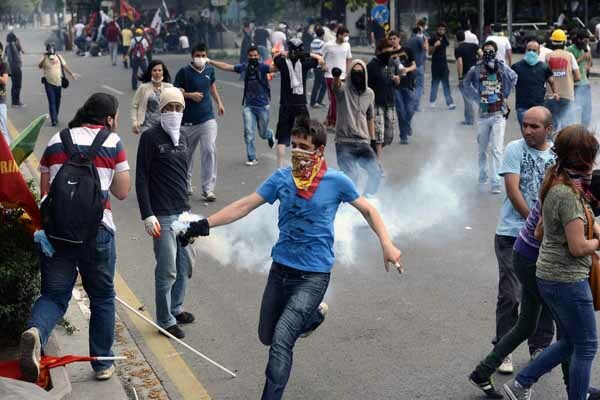 The protests initially started as a sit-in at the Taksim Gezi Park to protest the demolition but turned into country-wide protests after heavy-handed police tactics involving intense use of tear gas and water cannon.